Food Costs > How Much Do Blueberries Cost? How Much Do Blueberries Cost? Blueberries, a North American native plant, are perennial flowering plants that are known to be low in calories and high in nutrients and antioxidants. Blueberries found in the wild will usually produce a smaller berry; however, some varieties may also yield larger-than-average sizes. Eating blueberries, aside from the high nutritional value, are also known to be wonderful for your skin and blood vessels as they have anti-aging properties. On average, the price of blueberries will vary depending on the quality, quantity, how it’s processed, where you purchase and the time of year. A pint of fresh blueberries at the store can cost $1 to $4 per pint. Organic blueberries can cost 20 to 30 percent more, just like other organic fruits. Frozen blueberries, available year round, won’t change in price due to the time of year. Most frozen blueberries come in eight to 16-ounce bags and cost anywhere from $1 to $3. Fresh blueberries only make sense when blueberries aren’t in season. At Walmart, for instance, a 48-ounce frozen bag of blueberries retails for close to $10. At Trader Joe’s, a 12-ounce bag can cost about $3. Dried blueberries, which can come in smaller six to eight-ounce packages, will costlier, retailing for about $5 to $6 per pound. As for growing blueberries, a plant for your garden can cost anywhere from $5 to $15, depending on the size of the plant and where you purchase it from. Blueberries, when purchased fresh, will generally come in a pint packaged in a recyclable clear container. This allows you to see the freshness and the ripeness before you purchase it. Frozen forms, on the other hand, will come in a bag, often found in the frozen section. Consider purchasing berries during the peak seasons such as the summer. Add them to freezer bags and freeze them to use during the expensive seasons. How many blueberries in a cup? A half cup equals roughly 2.6 ounces. If purchasing a half-pint container, the average sized container you will find in a grocery store, you will find one pint contains roughly two cups. Cut that in half and a half-pint container will hold a cup. Blueberries, when purchased fresh, can store in the refrigerator for up to 10 days. If purchasing at a local grocery store, the most common brand you will find will be Driscoll; if not, it may come from a local farmer. Pay close attention to the packaging to see where your blueberries originated from. Dr. Axe says blueberries can combat aging, boost the brain, fight cancer, support digestion, promote heart health, benefit the skin and even aid weight loss. Consider going to a U-pick farm in your area. Picking blueberries by hand can usually save you a few extra dollars if you pick a lot. Farms, usually, will offer one-gallon buckets and will charge by the gallon. This price, like the prices mentioned above, will depend on the farm and where you live. 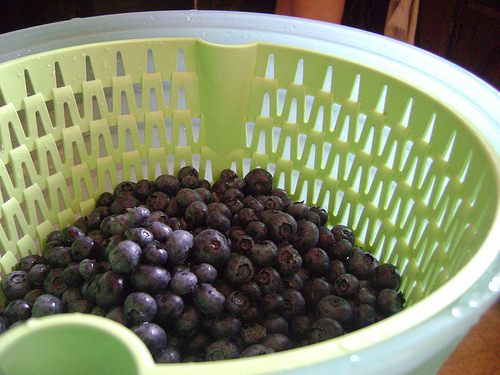 If the blueberries are in season, a one-gallon bucket could cost $15 to $25 and can yield close to six pounds of fruit. If purchasing frozen, local dollars stores often carry smaller six to eight-ounce bags. Blueberries, even when purchased frozen, can still retain its freshness and flavor and are great for smoothies and pancakes. Frozen blueberries, no matter when you purchase, will almost always be the best buy. If you have more than one grocery store in your area, some stores may have blueberries on sale, while others may not. It never hurts to look. 4.00 a quart picked and delivered.